Get Started and Sign Up Now to Claim Your Winpalace Bonus! Winpalace runs on the RTG (Real Time Gaming) software which is fast and sleek. They are licensed out of Curacao and have quickly become a favorite destination for USA players. If you like bonuses, Winpalace should be your top choice. No other online casino which accepts USA players offer more bonuses daily. Winpalace Casino is offering all new casino players a 200% match bonus up to $2000. If you are a slots player take advantage of the 300% match bonus up to $3000, by far the largest available. Both bonuses can be used on your first two deposits. There is also a bonus for Blackjack players which can be redeemed up to 10 times for a 100% match bonus up to $500. The bonuses do not stop there though, Winpalace offers re-load bonuses daily for both Slots and Table games. During our review they actually even sent us a free $175 free chip! The minimum deposit is only $21 and there is no maximum. See the Winpalace Casino Bonus for fulll details on the bonuses. 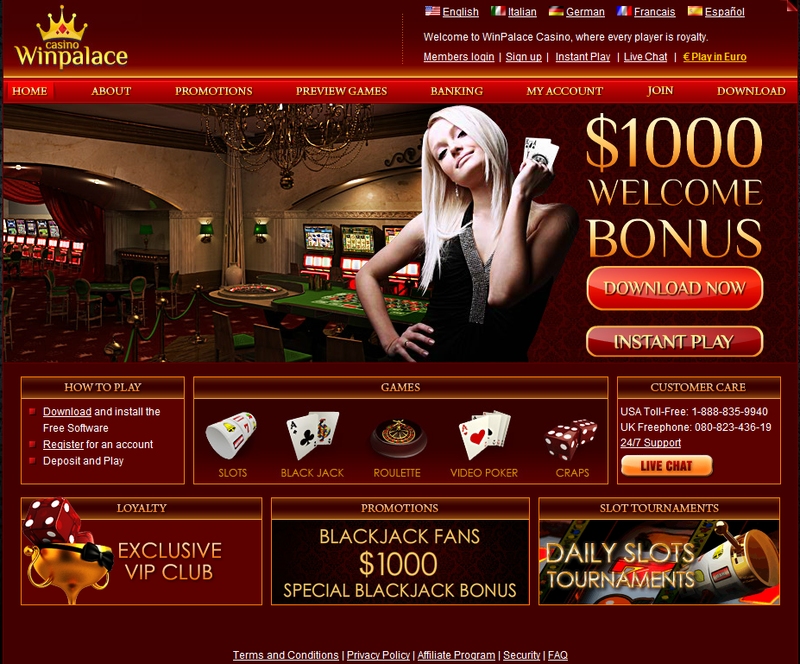 Winpalace may have the best selection of Casino Games and Slots of any online casino. Find a selection of slots available similar to Vegas! Over 20 different Video Poker games are available. The popular include Aces and 8’s, Deuces Wild, Bonus Deuces Wild, Jacks or Better, Joker Poker, Double Bonus Poker, 7’s Wild and many more. The Winpalace Casino offers all the popular slots with over 70 different Slot options. Winpalace also has a nice selection of Bonus Slots which get huge! Get instant support by phone or LIVE Chat but even e-mails are answered quickly. During our review e-mails were answered very fast, generally within 15 minutes. The customer support toll free phone number is available 24/7, so if you have a question that needs answered immediately you can always just simply call them. Winpalace offers Visa and MasterCard deposits for USA players. International players also have the option of Neteller and click2pay for deposits and withdraws. Winpalce may be the best USA online casino for depositing with credit cards. We made several deposits and never had one declined. Withdraws are processed by wire transfer with a $100 minimum requirement. The Winpalace Casino runs on the Real Time Gaming Software. The software is fast, sleek and very appealing. There is also a Flash casino available with a good selection of games if do not wish to download the software.